In this issue: a young girl and an unlikely ally on a mission, modern soldiers kick some Paleolithic derriere, and a threat to a crown prince goes awry! 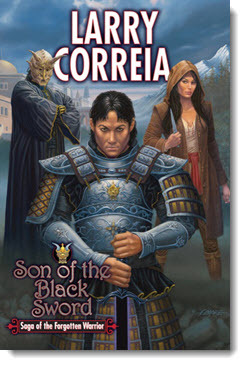 All that plus the first entry in a new fantasy series from Larry Correia. Rebellion, War, Honor . . . and the Fate of a World! 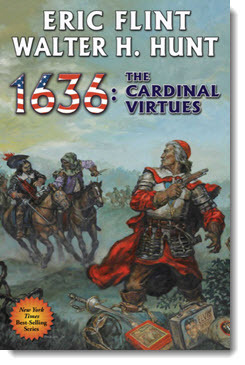 Get 1636: The Cardinal Virtues eARC now. Soon he may find himself on the wrong side of the Law he has killed to uphold. Now rebellion, war, and destruction rage across the land, and Ashok Vadal has been chosen by a powerful ancient weapon to be its bearer. Is he pawn or master of his destiny? The answer to that question will determine the fate of a warrior—but also the fate of a world! The first entry in the new Saga of the Forgotten Warrior from Larry Correia. Get Son of the Black Sword eARC now. When her mother is kidnapped by a group of Toads, fourteen-year-old Lalira Revyne must overcome her fears and journey forth to bring her back. But Lalira can’t do it alone. To rescue her mother she’ll have to find help in the most unlikely of places. New fiction set in the Balanced Sword/Phoenix Rising series from Ryk E. Spoor. Read “The Adventurer and the Toad” here. 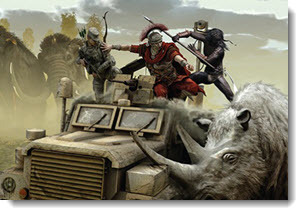 Modern Soldiers and Marines Cast into the Paleolithic! Michael Z. Williamson’s newest novel, A Long Time Until Now finds a group of modern day soldiers tossed back in time to the Paleolithic era. Which posed some challenges in the writing of the book: What was Paleolithic Central Asia like? What food was available? What kinds of shelters could be built to stave off predators and bad weather? Michael Z. Williamson set out to find out the answer to these and other questions. Here he relates the answers—those he learned from research, those he discovered through experimentation, and those he had no choice but to make up out of his imagination. Find out for yourself and gain insight into life some 15,000 years ago, and into the process one author took to deliver a rip-roaring good SF tale. 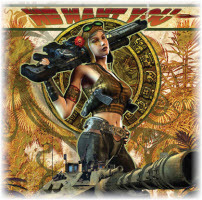 Read “The Distant Past: A Setting for Science Fiction” here. 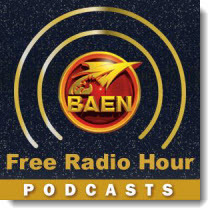 Coming soon to the Baen Free Radio Hour: Eric Flint, Mercedes Lackey, Jody Lynn Nye and Bill Fawcett on book two of their alternate history where intelligent cats and dinosaurs fight for dominance, By Tooth and Claw; Michael Z. William on time travel novel A Long Time Until Now; contributors to Grantville Gazette VII talk all things Ring of Fire. Plus: legendary filk musicians! Missed past episodes? No problem. We’ve got every episode archived for your listening pleasure. Short stories and an essay by science fiction writer and software developer Marc Stiegler, including the powerful and prescient title story about humanity facing the Singularity. For years the land of Ar has lived at peace. Here the catlike mrem rule by duty and honor. Now, from out of the east, their legendary enemies have risen again, sweeping toward Ar to begin their conquest anew. Under the careful guidance of the catlike mrem, the City of Niau has grown into a prosperous trading center. It lies, however, far to the east—on the very edge of the kingdom of Ar—ever vulnerable to invasion by the mrem's legendary enemies, the Eastern Lords. When the young herdsman Falon sets out on a mysterious mission to the border city of Tizare, accompanied by a would-be wizard and half-wild child, their quest will become all that stands between the kingdom of Ar and an eternal nightmare of tyranny. Legends surround the Eastern Lords and their servants, the liskash—lizard warriors—but few have ever seen them. 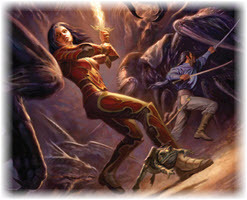 But now the Eastern Lords have waged a devestating assault against the people of Ar, a group of powerful Mrem wizards must fight with their every resource to protect their vulnerable world. First volume in a multigenerational epic about the United States Air Force Academy, ranging from the aftermath of World War II, to the jungles of Vietnam, to the deserts of the Middle East, written by retired USAF Colonel, PhD physicist, and Nebula-award nominee. 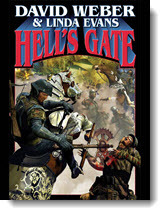 Fourth volume in New York Times best selling author’s rollicking fantasy adventure series. Keith Doyle has made it to graduate school. In between classes and hanging out with his magical friends, the Little Folk, he gets caught up in an evil scheme to reveal the existence of elves to the world. A dystopian adventure of a special young woman coming of age in a world trying to rebuild from the apocalypse. Dark science fiction set in the crumbling ruins and blasted deserts of a future where all people are not created equal . . . and where control is exerted by savage rituals of blood. In a future world, the gun has fallen and the sword has arisen. An ancient evil bridges the earth plane and the abyss, bringing a massive horde of the most feared monsters in all the five hells. Through light and darkness, destruction and chaos, the Children of the Gene battle towering demons to defend their world against everlasting darkness.